The airline is interested in digitizing on-board flight information that has typically been printed out, Flightglobal has found out, and the company will start using Apples iPad as an electronic flight bag (EFB) in a limited testing phase that includes 22 devices. The iPads will be preloaded with manuals, charts, and specific iOS applications that would help pilots receive updated information or compute various calculations otherwise done by hand. Other preloaded tools include a writing app, a web browser, a PDF viewer, a Wi-Fi finder app as well as crew rest and cruise rest period calculators. Although all 22 iPads will have the same suite of Delta apps installed, the pilots will have the opportunity to install any additional aviation applications as required during the test period. Delta aims to bring instant wireless communications capabilities to its flights and a tablet like the iPad could provide such capabilities to current crews and even take part in changing the training process for Deltas pilots. During this process the company will use both Wi-Fi and 3G+Wi-Fi iPad models. The test will check whether the iPad solution works for users who are less familiar with technology. "Roughly a quarter of our testers rated themselves as 'tech un-savvy,'" Delta said. "We need to make sure a solution is user friendly to any pilot, no matter their IT skill level while providing us a top of the line product that gives us long term expansion capabilities." Domestic passengers on the airline already have access, for a fee, to Gogo Wi-Fi in-flight connectivity, and the company is also exploring adding such capabilities to its international flights. 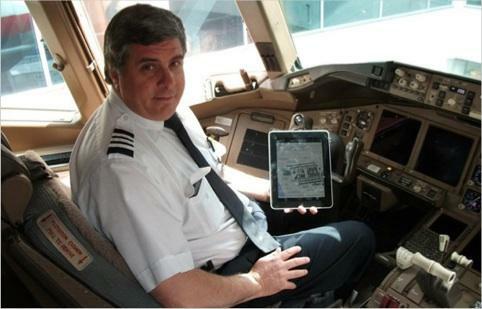 Once the iPad testing is complete, the airline will swap Apples tablet with Android Honeycomb devices. 16 Motorola Xooms will then be used as EFBs in a new trial run starting with mid-September. The FAA has already authorized the use of Apples iPad as EFBs. Both American Airlines and Alaska Airlines have started to replace paper manuals, which weigh as much as 40 pounds, with iPads preloaded with all the information required by pilots during flights in a similar endeavor to remove all on-board paper and use tablets containing all the required flight data instead.